One of the hottest new car and vehicle audio electronic products of 2011 in Tempe, AZ and Phoenix, Arizona would have to be the new Python pager/remote start alarm. With an incredible 1mile range and a multicolor remote that will tell you everything from the temperature in your car to if your vehicle is locked or unlocked, this sleek device is convenient, cool, and practical. The new Python pager/remote start alarm has a car finder feature so that if your car is in a crowded parking lot you simple hit a button on the remote and your car will alert you where it’s at and has a silent arm/disarm feature. 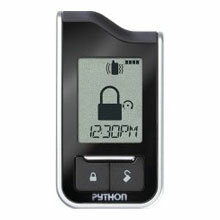 The Python Pager also mode and a non-battery remote that you charge like a cell phone that, depending on usage, will last approximately a month to 2 months on a single charge. Our expert techies at Sounds Good To Me, located in Tempe, AZ near Phoenix, Arizona, have test marketed the Python Pager in our company car and its worked flawlessly for the last year and it’s operation is incredible and simple use. Oh and also you can get an app for your smart phone that will allow you to use many functions that the remote does right from your phone…amazing! Sounds good to me has The Python Pager – Remote Start Alarm in stock and we’re ready to install at your convenience. I have a python 991 and would like it installed in a 2005 chevy avalanche. How many hours would you need the truck for and how much for the install. Depending on what features you want hooked up roughly $200 plus parts,call anytime for a appointment.Dave/480-968-8543.